The French and Indian War, in North America, began over the right to access and colonize land and to the export trade items which that land would produce. This war, between the superpowers of France and Britain, is known as the Seven Years’ War when fought outside of North America, and is considered a World War. There are a few compelling reasons to explore the cause and outcome of this war, because, although this war is overshadowed by the Revolutionary War, it is a foundational event in American history. Britain’s involvement in the French and Indian War greatly influenced the Revolutionary War, and can help shed light on the British disposition to Revolutionary colonists. To understand what caused the French and Indian War, it is essential to reveal the differing goals of the French and British as they became involved with North America. The British had very early and clear intentions of establishing permanent colonies, and of course of developing an export trade for the British crown. The French, on the other hand, intended to seasonally move through the land, hunting and trapping, trading with the Indians, and developing trading posts for France. Their goals may have been different, but their means to that end brought them into conflict. The French, moving freely all around the Great Lakes, and down the Mississippi River Valley, wanted to continue their free range east to the Appalachian Mountains. The British colonists, due to overcrowding and a need to access prime hunting land, wanted to move west beyond the Appalachian Mountain Range. The intentions of the French and British to occupy the same land were the reasons why they became embroiled in a terribly costly war. The battles during this war, in the North American theater, took place all along the strip of disputed land from the Ohio River Valley up north through the St. Lawrence Seaway. But, one battle may be of particular interest to young historians: the battle for the French held Fort Duquesne, pronounced du-KANE, at the point where the Allegheny and Monongahela rivers come together to form the Ohio River. It involved George Washington as a rugged outdoorsman and soldier. By observing the Indian trading partners and allies of the French, the colonists learned new military tactics involving small raids, ambushes, and sabotage. This newly learned tactic, now referred to as guerilla warfare, would come in handy to the colonists when they fought the British in the Revolutionary War, and is one of the big take away lessons from the war which you’ll want to refer to later while studying the Revolutionary war. The end of the war, at the Treaty of Paris in 1763, brought Britain a very expensive victory. 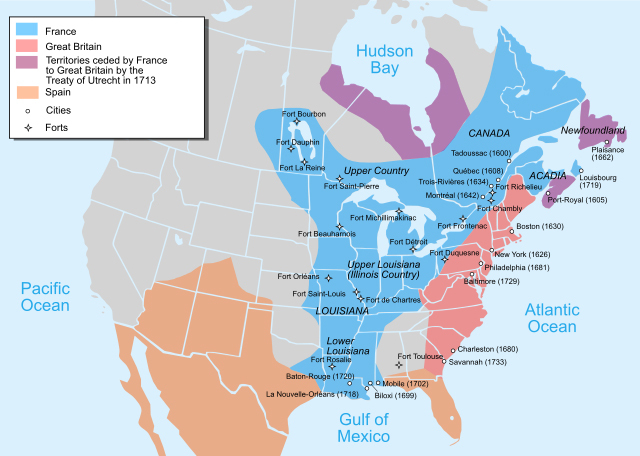 France agreed to cede the enormous swath of land from Canada south to the Gulf of Mexico, and from the Appalachians west to the Mississippi River, which had been known as New France. And, as a result, the French residents in Nova Scotia, Prince Edward Island, New Brunswick, and parts of present day Maine, were expelled, and many were either deported back to France, or resettled themselves in Louisiana. Britain did gain a lot of territory, but since the war was extremely costly, they also gained a lot of debt. And, here comes the other big take away lesson from the war which you’ll want to refer to later when studying the Revolutionary War. Britain had a problem of how to pay down that debt. The answer to the problem came as a decision to tax to the colonists: The Stamp Act of 1765. This Stamp Act was just the beginning, as more taxes were to come, and it launched the start of a 10 year struggle between the American colonists and the British crown, which was only to be resolved by the Revolutionary War. So, be sure to study the French and Indian War, a World War fought over the colonies in North America. The war taught the colonists how to fight in the wilderness, and ultimately removed the French impediment to the colonization of land west of the Appalachians: a land eagerly explored by early pioneers like Daniel Boone. But this acquisition also brought Britain crushing debt and the perspective that the colonists ought to help pay for this debt, through taxation. This became the prelude to another war, the Revolutionary War. The post %%POSTLINK%% appeared first on %%BLOGLINK%%. Project oriented educator, author, and publisher of the History and Nature Portfolios, and long time homeschooling mother of five. This is terrific, thank you for this very clear explanation. As a Canadian home-schooler, I am always on the lookout for resources that expand my teaching of Canadian history. So many of the great resources out there are very America-centric, and the Canadian side of these events is underplayed. Please note that when the French ceded all that land to Britain, it was a very momentous event in Canadian history. The way the British dealt with the French settlers at that time set the stage for future conflicts among the French and English in British North America. We are still dealing with the repercussions to this day. I look forward to future posts, and I hope that you will consider your Canadian audience and delve deeper into the links between the history of our two countries. As Canadians, we can’t help but be exposed to American history, It wouldn’t hurt Americans to learn a little more about their neighbour to the north. Carol, you are very welcome. I am interested in writing about major events which don’t always get covered adequately. 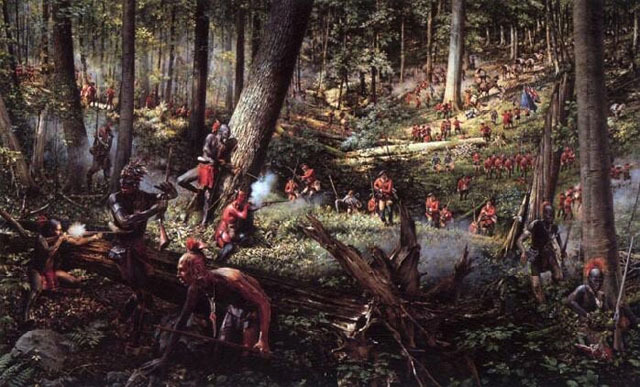 I have another post, half way done, about the Great Expulsion which occurred during the French and Indian War. It is a whole subject in itself, so it didn’t really fit with this post. And, even though it is such an important chapter in Canadian history, it also helps Americans understand American history and state history. This is a great write up.. clear and concise!! I look forward to reading your other articles. Project oriented author and publisher, and long time homeschooling mother of five. Pinterest images relevant to each chapter in the History Portfolios. "History can inspire the imagination; the History Portfolio Series can capture the inspiration." © 2019 Homeschool Journey. All Rights Reserved.